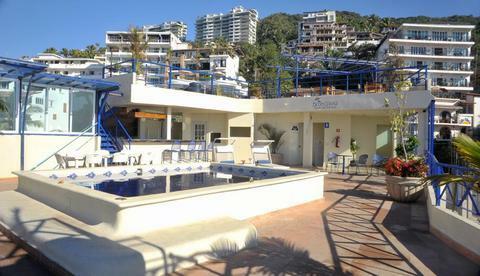 Located on the 6th floor of the LGBT friendly Blue Chairs Resort the rooftop pool offers views of the Bay of Flags and the Puerto Vallarta cityscape. The free form outdoor pool features colorful blue chaise loungers, ceramic tile pool deck, sun umbrellas, and a popular pool side bar known as the Blue Sunset Rooftoop Bar. The Blue Sunset Rooftop Bar, serves a variety of alcoholic and non alcoholic drinks as well as light fare. The rooftop bar also hosts a variety events including drag shows, karaoke, and gay bingo.